Summer is finally with us, the sun is shining and the birds are singing. It’s great to feel the warmth of the sun and get out in the fresh air. We are all drawn into our gardens, parks and outdoor places to enjoy the natural world. These are social spaces for summer gatherings, important for family, friends and meeting people. Our garden is simply another room in our house, even if it a seasonal or fair weather one. Some rooms are tidy, some are not. Some rooms need a makeover, some rooms need re-designing. Gosh, my garden’s in a mess…tidy up, makeover or design again from scratch? The costs of re-designing your garden by professionals is astronomical, though. Did you see the spectacular gardens at the RHS Chelsea Flower Show 2017 and the Hampton Court Flower Show 2017? Wow, how on earth can these garden designers create these superb garden rooms from scratch? Don’t worry, you don’t have to go to the vast expense of designing and executing a completely new garden. There is an alternative…simply buy garden accessories, garden products and outdoor furniture from the extensive range at Brilliant Wall Art. 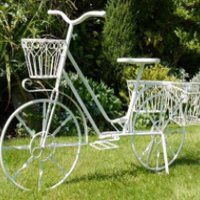 View our categories of Garden Furniture, Garden Accessories, Garden Wind Spinners. My personal TOP PICK is the Raina design Metal Garden Arch. It's made from metal, with a white/cream finish, supplied in four pieces and simple to construct. The side pieces do fold flat if you wish to store it inside during the winter months. This stylish arch measures approximately 225cm (88.5") high x 124cm (49") wide. What a great focal point for your garden. Why not take advantage of our multi-buy promotion? You could save up to £30 on your wall art. Simply spend a few minutes browsing our webpages, we offer a myriad of products and ideas. Enjoy your Summer gatherings and Summer events…Have Fun in the Sun.